Spice Rack – April 2014. The often repeated adage that you can never have enough storage space is especially apt when trying to live aboard. As my wife and I continue to prepare for our upcoming voyage we have been trying to optimize the space we have on our Pacific Seacraft 34, Indigo. 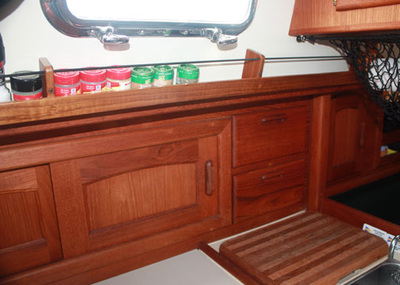 In order to free up some valuable locker space I decided (Marya decided) to make a spice rack to be installed on the bulkhead over the stove, and I chose teak to match our interior and the factory finished look. The first step was to measure how big to make it. Marya wanted it as big as possible, and hold as much as possible. I initially thought of making it deep enough to hold two rows of spice jars, but found that it would probably stick out too far and become a problem (obstacle to whack my head into) when accessing the deep cabinet space below the rack. After measuring for length, I constructed a pine mock up and was glad I did. The first issue that I found was that a standard spice rack design would make it impossible to remove the spice jars, due to the low clearance from the overhead cabinet. The second issue was that the bulkhead to which I was attaching the rack to is not flat, but gently curves outward. The curve was easy to adjust for. I used a small washer and a pencil to trace the curve onto the pine mock-up. I then cut that curve on the band saw and sanded out the small irregularities. Then I taped that to a piece of teak board using double sided tape, making a template guide. Using a flush cut router bit with a bearing on top, I routed the curve into the teak. I then cut the bottom front batten and the 4 uprights, and glued and screwed the whole thing together. Initially, I had planned to use a bronze rod to retain the jars from tipping forward. However, after doing the mock-up test fit I learned that was not going to work. I played around with various other methods of keeping the jars in place while sailing but still allow easy access when needed. 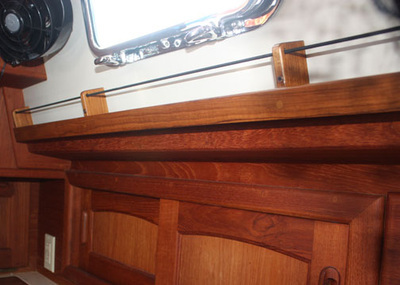 I thought of using hinged fronts, spring loaded retainers, fishing line and a small guitar tuner, etc. But, in the end the easiest and most trouble free solution came to mind – shock cord. It will easily hold the jars, doesn’t require any latching/unlatching, can’t forget to secure them, and is easy to install and use. I was able to find solid black 3/16” shock cord, drilled the uprights for it to pass through, and tied a knot in each end to hold it in place. The final piece to figure out was how to attach it to the wall. I could have plugged the screw holes for the attachment screws, but I wanted to varnish the whole thing prior to installing, so I left the screw heads visible, and found some bronze screws that I think look pretty nautical.